The I-5 Ship Canal Bridge noise reduction test project officially marked its first anniversary earlier this month and the results haven’t been as dramatic as had been hoped. 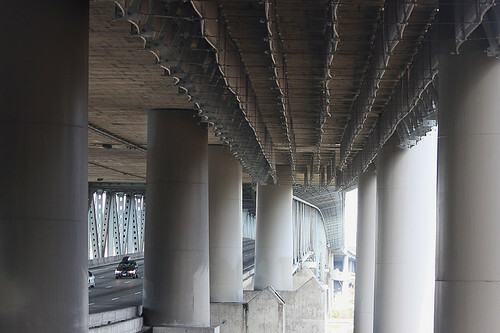 The Washington State Department of Transportation is testing the ability of fabric panels to dampen the reflected noise from the I-5 express lanes. The panels were hung under the I-5 Ship Canal Bridge on a 500-foot test section at the south end of structure, between E. Allison St. And E. Gwinn Place. It was hoped that the panels would provide noticeable and measurable levels of noise reduction for nearby residents. The press release says the WSDOT is learning more about “the kind of noise that travels and which kind of noisy noise is most frustrating to local residents.” The WSDOT engineers are analyzing the pitch of the reflected noise, its direction and how it bounces to see if the panels can be moved to make them more effective. Unfortunately, there isn’t much money left in the project’s budget, so the WSDOT says we probably won’t be seeing big changes soon. Sound tests will continue until 2013 when a final report on the project will be issued. Read our previous post to find out more about the project. Our video explains more about the project. This entry was posted in Uncategorized on November 20, 2011 by cdmilton. Why are we wasting money on this project. If you don’t like freeway noise, don’t live near a freeway. I’m an acoustical engineer and I find it hard to believe that an engineer worth his or her salt would think this would provide any benefit to those who still have a line of sight view of the highway. That’s noise control 101. This had to have gone through a review phase and I’m surprised it wasn’t flagged. I commend WSDOT for trying to mitigate the negative effects of this freeway that slices right through residential areas. Highway noise In dense areas has non-neglible negative health and economic impacts. As the owners of this freeway, they most definitely have a responsibility to continue investigating ways to address this problem. Go in any Safeway parking garage and look at the Acoustical/Fire Barrier foam they spray on their ceilings. That stuff is amazing in its ability to dampen the sound level in those garages. And I bet it didnt cost a million $ to install, test and re-test either. The Structural department did not want to do some strengthening that would have been needed to ccomodate the original metal acoustic box design; the Maintanence department did not want to impair the under views of the bridge when it hangs under there with its “U-bit trucks”; the Budget dept probably liked a cheaper panel and installation; the Installation folks found it easier to install panels when they were spaced a yard apart, rather than containing and trapping the noise; So the computer moddeling recommended an orange that was projected to cut the noise 10db, but we got an apple of widely-spaced bags that cut the noise 1 db. A Eastlake Community neighborhood meeting on this subject is scheduled for 7pm Jan 9th at the Eastlake School. You are welcome to attend and participate. The new 520 bridge will be disgorging more cars in enlarged exit lanes into the northbound Express Lanes under the bridge at all hours of the day and night. The 1960 bridge, with 30 year design life, was badly designed, with no thought to noise control. The 4 communities partially underneath, Eastlake, Roanoke, University and Latona, will continue to bear more of the environmental cost of commuting, and probably will loose the nightime mittigating express lane closures we now get.